Raising money for charities is something near and dear to my heart. It does a world of good both financially for the charity, and also spreads the word about all the great work the charity is doing. Often times, other people decide to get involved and even more good is created. Every time one of my friends is running a race, doing a triathlon or just feels strongly about something, and asks for my support, I try to give a little. Lately though, I've been a little bummed out by the way people have been asking for donations. Folks have been using new tools like Facebook and Twitter and mass email to broadcast their fundraising needs. Bravo for using technology to reach more people, but it feels impersonal. I love hearing stories, it's what I respond to, and that is especially true when donating. In the past, friends raised money via social events like Bake Sales or Bar Nights. In almost every case, there is a compelling story as to why people are raising the money for a specific charity, but the story is lost in 144 character Facebook and Twitter updates that just point to a URL. Even emails with 2 pages of text are tough to make it through. Technology has made it easier to reach people, but extra effort is needed to tell a story through that channel. If we don't get better at engagement and storytelling, people will start viewing these mass emails and status update solicitations as a "friend tax," something you must do to stay in good standing, but not something you enjoy or believe in. This brings me to Brian Mullen's charity, Team AntarctiKate, because Brian is raising money, and awareness in a more interactive way. He emailed me about his charity, then started a Tumblr Blog, and started the conversation. 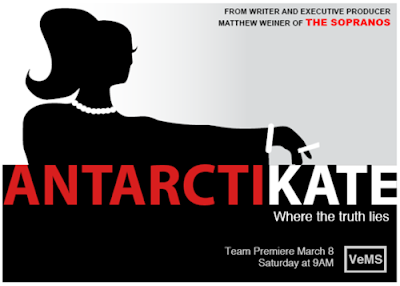 When you go to his blog, you find pictures, stories about his wife Kate who has MS and my personal favorite, the graphic below which will appear on Team AntarctiKate's t-shirt. It's a play on my favorite show, Mad Men, and couldn't be more tastefully done. Brian is investing time and effort to build a story with a bunch of different tools. He's creating engagement, maybe not exactly like a Bake Sale or Bar Night, but it's heading that direction. It feels good to give to Brian's charity because I can see how important it is and he has constructed the story so well. When you get a chance, invest a little time in Brian's blog and see if it's worth an investment in dollars to be a part of the AntarctiKate story.